Cite page (MLA): "Edition Guide." In Livingstone's Final Manuscripts (1865-1873). Megan Ward and Adrian S. Wisnicki, dirs. Livingstone Online. Adrian S. Wisnicki and Megan Ward, dirs. University of Maryland Libraries, 2018. Web. http://livingstoneonline.org/uuid/node/cd82bd9d-3e50-421b-969e-3f513a20258b. This page provides a skeletal outline of the entire critical edition of Livingstone's final manuscripts (1865-73). It enumerates all the main sections of the edition, including core data and critical materials. Edition Guide - the present page: provides a skeletal outline of the entire critical edition of Livingstone's final manuscripts (1865-73); also enumerates all the main sections of the edition, including core data and critical materials. Project Team - introduces the project team that developed the critical edition of Livingstone's final manuscripts (1865-73). Acknowledgments - cites the individuals and institutions that have made a special contribution to supporting our work in developing the critical edition of Livingstone's final manuscripts (1865-73). Scope of the Edition - defines the scope of our critical edition of Livingstone’s final manuscripts (1865-73); overviews the importance and content of the manuscripts, then enumerates the items published through our edition as high-resolution images with critically encoded text and full metadata; as high-resolution images with full metadata; or in encoded facsimile; closes with a synopsis of the critical materials included in the edition. Items with Images & Transcriptions - provides access to downloadable images and critically encoded and edited transcriptions of Livingstone's final field diaries (I-VII, X, XIV-XVII) and the Unyanyembe Journal as well as three bonus texts (the fragment of field diary XII, the second Unyanyembe Journal, and the notes and calculations for Field Diary XVII). Items with Images Only - provides access to downloadable images of the manuscript items included the present edition that have not be critically encoded and transcribed (six notebooks and nine maps). Bonus: Additional Final Manuscripts - provides access to downloadable images and, in some cases, critically encoded and edited transcriptions of additional Livingstone manuscripts from his final travels. These items are not formally part of this edition, but are nonetheless published by Livingstone Online and so made accessible here. For context, the items published through the present edition are also included. Multiple Versions of the Text - allows users to engage in comparative study of the Livingstone texts published through the present edition. Here users will find critically encoded and edited versions of many different texts related to Livingstone's his final journey: twelve final field diaries (1865-73), the Unaynayembe Journal (1866-72), three bonus texts (the fragment of Field Diary XII , the second Unyanyembe Journal , notes and calculations for Field Diary XVII ), and the published version of the Last Journals (1874). 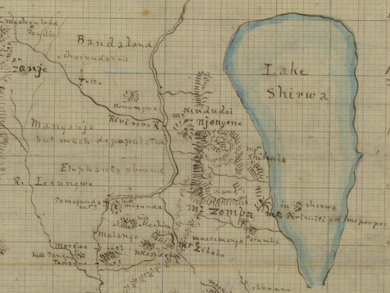 Unyanyembe Journal: Overview - introduces Livingstone’s Unyanyembe Journal (28 Jan. 1866-5 Mar. 1872); covers the journal’s dates and places, Livingstone’s thematic concerns, and the conflicts he faced as he created this record; closes by considering Livingstone’s rhetorical situation as he writes the Unyanyembe Journal in Africa, among African and Arab populations, but for a primarily British audience. The Final Field Diaries: General Overview - focuses on three of the key themes that emerge across the twelve Livingstone field diaries (1865-73) included in this edition: ethnography, religion, and authority; also analyzes how Livingstone understands the slave trade in relation to each of these categories. Throughout, discusses how Livingstone’s representations of African and Arab cultures are framed by his own cultural values and beliefs. Field Diary I: Overview - introduces Field Diary I (4 Aug. 1865-31 Mar. 1866); walks through the key narrative events in the first two-thirds of the diary, then enumerates some of the information captured in the diary's last third; concludes by discussing some of the diary's prominent material features. Field Diary II: Overview - introduces Field Diary II (4 Apr.-14 May 1866); notes key events in the first two months of Livingstone's journey inland from the eastern coast of Africa and summarizes Livingstone's observations on local climate, topography, and culture; also describes the form of the diary and its key features. Field Diary III: Overview - introduces Field Diary III (14 May-30 June 1866). The first part summarizes Livingstone's emerging concerns with food scarcity, slavery, and struggles for authority; then moves on to analyze how Livingstone's composition methods differ in this diary from the previous two. Field Diary IV: Overview - introduces Field Diary IV (1 July-5 Sept. 1866); analyzes Livingstone's dominant concerns: the slave trade and his authority struggles with porters; concludes with notes on the material form of the diary. Field Diary V: Overview - introduces Field Diary V (5 Sept-23 Oct. 1866); explicates this field diary's primary focus: medicine and Christian conversion, i.e., the concerns that brought Livingstone to Africa at the beginning of his career; also describes the material form of the diary. Field Diary VI: Overview - introduces Field Diary VI (24 Oct.-23 Dec. 1866); overviews Livingstone's regular diary entries – primarily about an ongoing local African conflict – as well as his notes and drawings of African daily life; also explores Livingstone's composition practices. Field Diary VII: Overview - introduces Field Diary VII (26 Dec. 1866-1 Mar. 1867); covers both the first half of the diary, which deals with food scarcity, and the second half, which sets out Livingstone's dealings with two chiefs, Chitapangwa and Moambo; concludes with a description of the diary's physical attributes. Field Diary X: Overview - introduces Field Diary X (9 Sept. 1867-2 Jan. 1868); gives an overview of Livingstone's negotiations of the complex relationships between Arabs and Africans; also includes a description of Livingstone's composition practices. Field Diary XIV: Overview - introduces Field Diary XIV (14 Nov. 1871-14 Sept. 1872); summarizes Livingstone's account of his iconic meeting with Henry Morton Stanley and documents their time together; also analyzes Livingstone's renewed communication with Europe and the United States in the wake of this visit, as well as his account of ongoing local violence between African chiefs and the impact on this violence by Arab traders; concludes with a description of the material features of the diary. Field Diary XV: Overview - introduces Field Diary XV (7 July-1 Dec. 1872); explicates the unusual form of this field diary (XV), which is not sequential but instead expands on many of the entries in the previous diary (XIV); also describes the new kind of notebook Livingstone used to create this diary. Field Diary XVI: Overview - introduces Field Diary XVI (1 Dec. 1872-6 Apr. 1873); assesses the large quantity of meteorological and topographical calculations that Livingstone recorded in this, his last completed field diary; also describes the form of this diary, which is the same as that used for Field Diary IV. Field Diary XVII: Overview - introduces Field Diary XVII (9-28 April 1873); describes the final entries made at the end of Livingstone's life; also examines the form of the diary and ends by outlining the note written in the diary after Livingstone's death by his attendant, Jacob Wainwright. The Final Manuscripts: Three Bonus Texts - provides a set of short introductions to the three bonus texts included in our critical edition of Livingstone’s final manuscripts (1865-73); discusses the value of the three texts collectively, then provides an overview of the content and form of each individual text. The Aftermath of Livingstone's Death - provides a curated selection of images related to the immediate aftermath of Livingstone's death. Note on Encoding the Final Manuscripts - outlines some of the key editorial challenges posed by Livingstone’s final manuscripts; also discusses the coding strategies of the project team and the role of the edition’s users in working with the manuscripts in this edition. TEI P5 Encoding Guidelines - presents the customized Text Encoding Initiative (TEI) P5 guidelines that have guided our editing and encoding of Livingstone's final manuscripts. LEAP (2013-17): A Project History, part I and part II - sets out a history of LEAP: The Livingstone Online Enrichment and Access Project, the NEH-funded initiative that resulted in the development of the current Livingstone Online site and the present edition; combines text, images, and access to downloadable project documents to provide an intimate, behind-the-scenes look into project. Project Bibliography - offers an integrated bibliography of the primary texts cited in the present critical edition. Download basic reading copies of all manuscripts (4 MB) in one ZIP file or select a specific text.